For Lease ! - Fully Furnished ! Lawn Care, Pool Care, Interior and Exterior Pest Control, Residence Security System Service, and HOA Fees INCLUDED!! 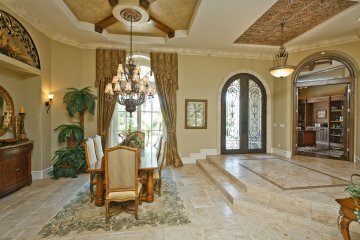 This exquisite Mediterranean luxury home is located in an exclusive gated and guarded community in Windermere. 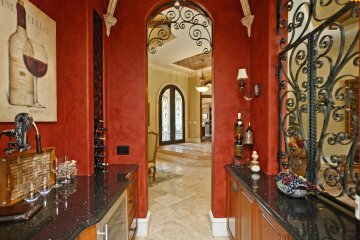 Tuscan-inspired throughout with arched room entries, decorative iron, stone flooring - and all on one floor! A wide welcoming circular brick-paved drive at the front is embellished by a lush Florida landscape. One enters through double Cathedral iron and glass doors into an open floor plan with stone floors throughout and large rooms which seamlessly flow together under architecturally-detailed soaring ceilings. There are 4 bedrooms each with private bath. A wonderful Theater boasts tiered seating for 8 people. 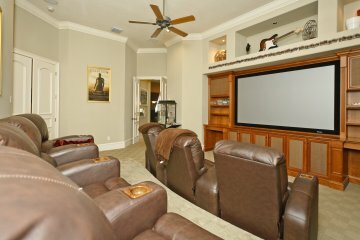 You will love the 35' x 25' Game room with rich wood floors, a raised T.V. 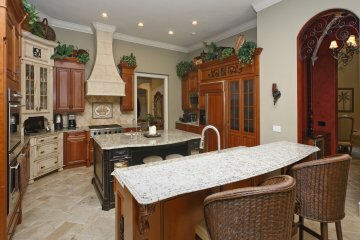 viewing area and - best of all - a custom Refreshment Bar with refrigerator, wine cooler and sink! Working at home will be a pleasure in the 20' Office-Library with rich wood flooring and an 8' wide Palladium window overlooking the front landscape. Glass doors span the rear of this beautiful home opening to an outdoor screened living area. Imagine a resort setting in your back yard with a screened outdoor living area, which is fabulous, and consists of a 25' living "room" with fireplace and an adjoining dining "room" with cooking area, sink and refrigerator. a refreshing free-form pool and heated spa are embraced by large decking, all of which is framed by a beautiful landscape and gardens. There is a 4-car Garage. This is all you would ever want in a Florida lifestyle! To add to your pleasure, this home is very convenient to wonderful shopping areas, restaurants and only 15 minutes to all Disney attractions. Don't miss it!